← To Yarn bomb, or not. . . . . .
Keeping on with the crafting, no matter what! It’s been a very strange week for me this week. The ME has been really playing up, and I’ve been sleeping some very strange hours – to the point that I have to look at the date and time on my laptop to know what day it is, and when. 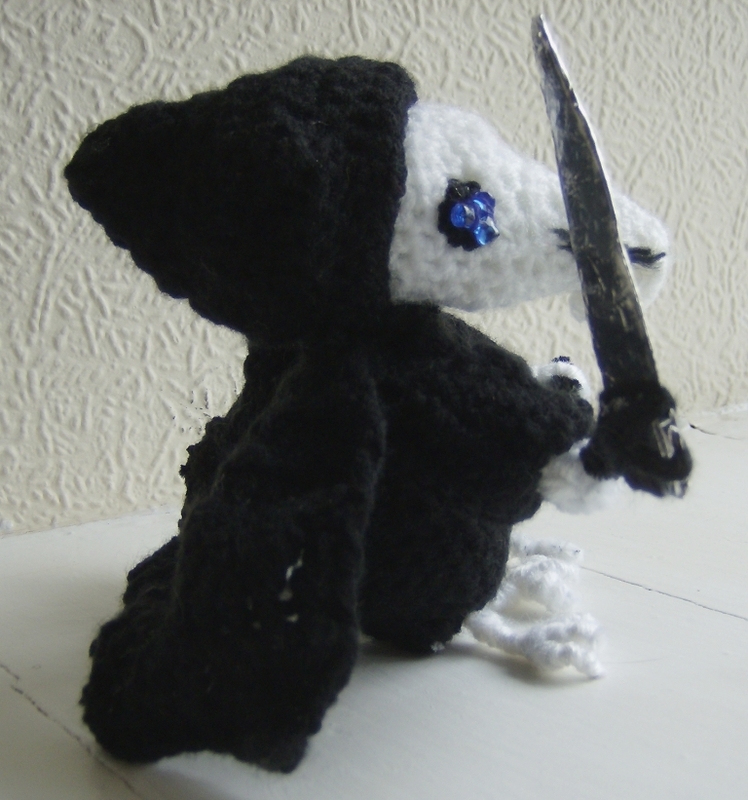 I have managed to make a couple of things though, despite the oversleeping. I managed to make a second outfit for my friend’s doll, Muriel. I had already made a red riding hood outfit for her, and so I decided to make her a more summery outfit, and in the peach shades that my friend prefers. I’ve mentioned before that this doll is an awkward size. 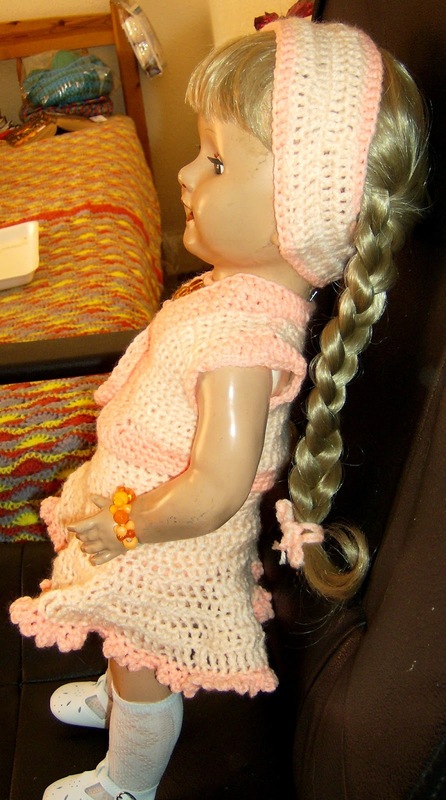 At 21″ she’s too big for all of the crochet patterns I’ve been able to find, and so I decided that I’d do what my mum always does when she’s given a doll to dress – and I’d make it up as I went along! 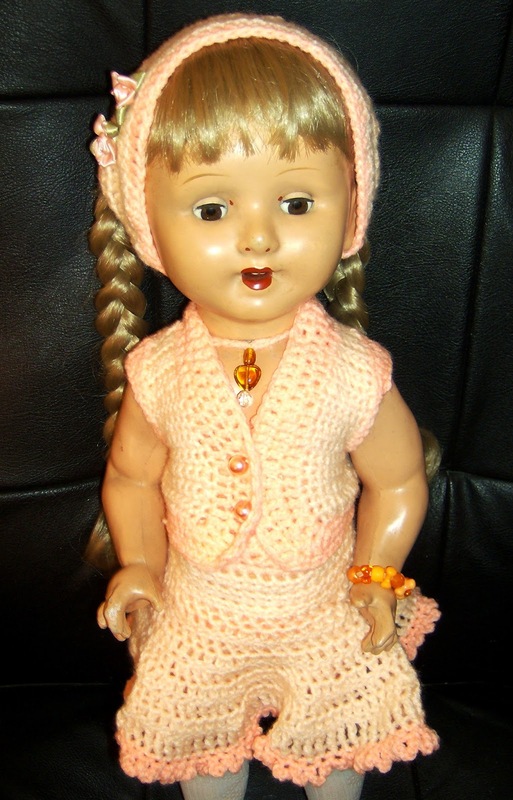 I was really pleased with the way the outfit turned out and, when my friend received the parcel with doll and outfits in it, she was over the moon with what I’d made (I hadn’t told her what it would be). 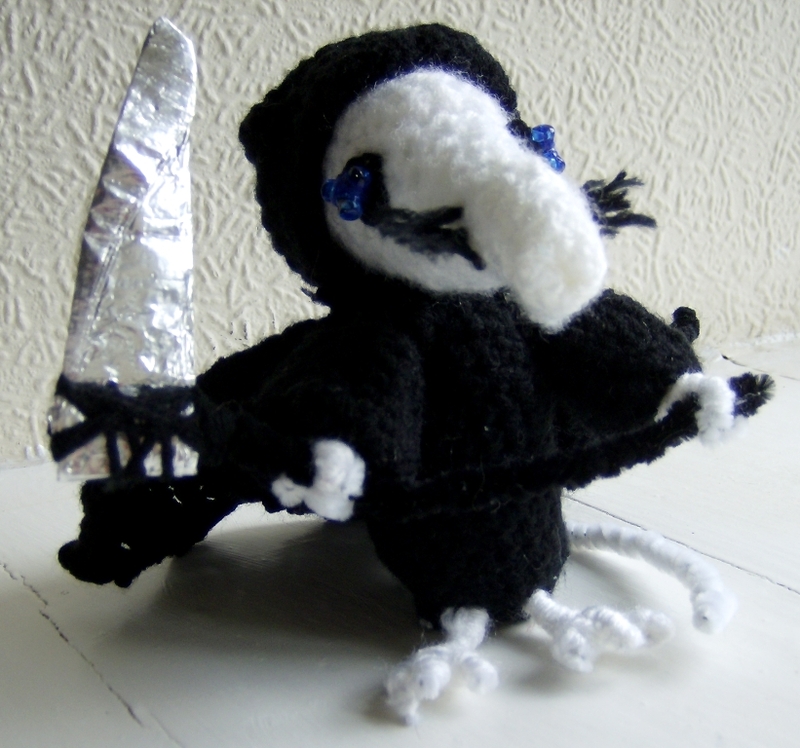 After I’d sent Muriel on her way back home, I wasn’t quite sure what to do next, until I went onto Facebook, and looked in on my fellow Discworld devotees, where I saw a knitted version of Terry Pratchett’s Death of Rats. 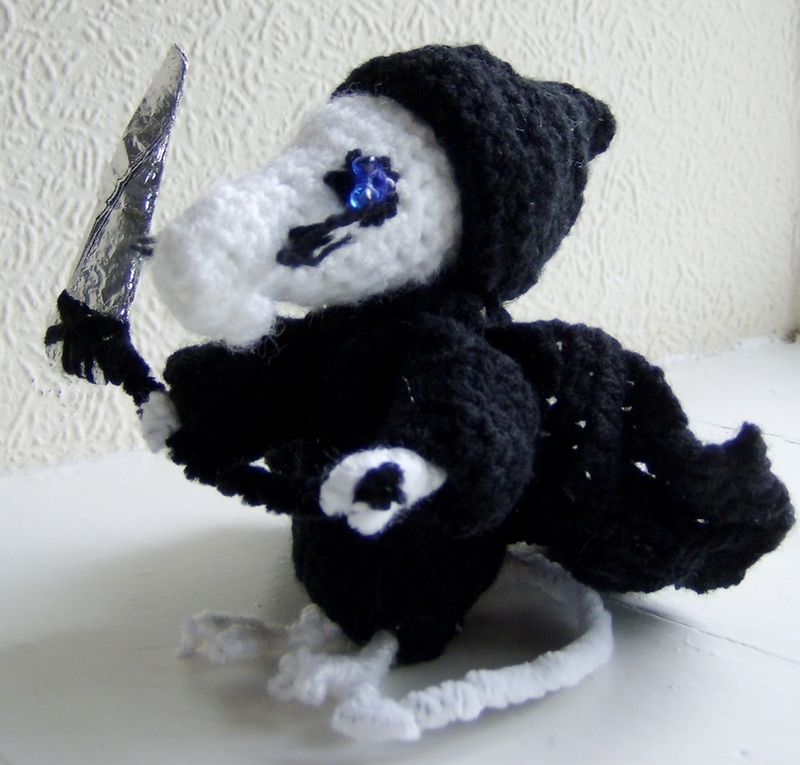 Death of Rats – the Grim Squeaker! I used white pipe cleaners to make the hands, feet and tail. I used blue buttons to give an impression of the wink that Death and the Rat used. DOR’s cloak. 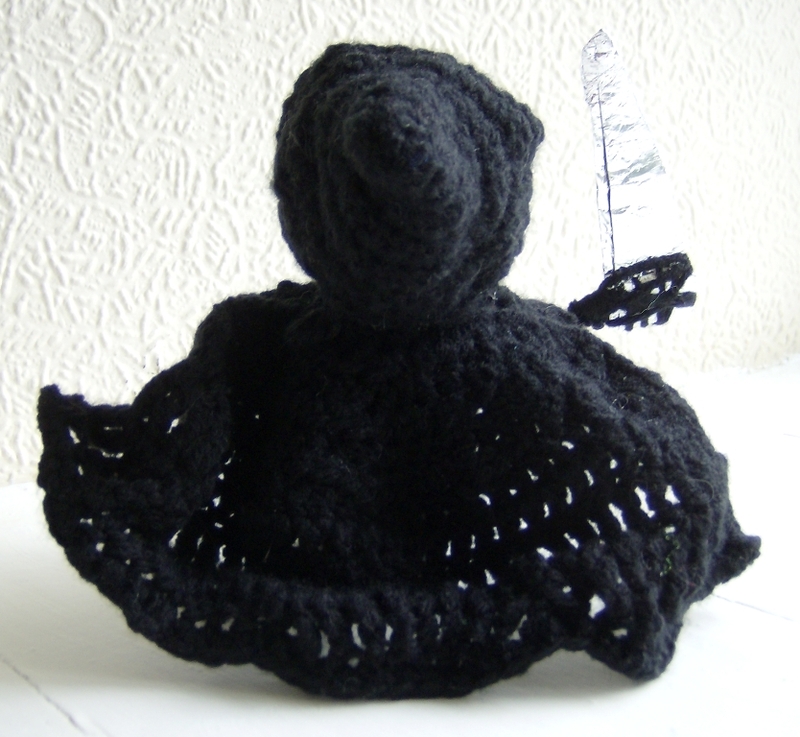 I used a black pipe cleaner to edge it, to make the shape. As I hate to be without a project, I also completed this month’s Crochet Crowd challenge. 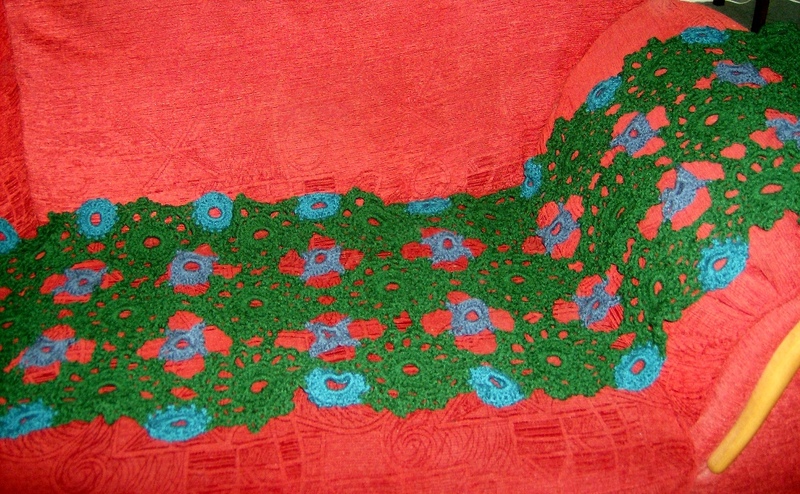 This month it was a circular motif throw and, for a change, I actually managed to complete it in a few days. The pattern itself was a little complicated, especially for someone like me, who had never tackled joining motifs together as I went but, once I’d got the hang of it, it was made up quite quickly.